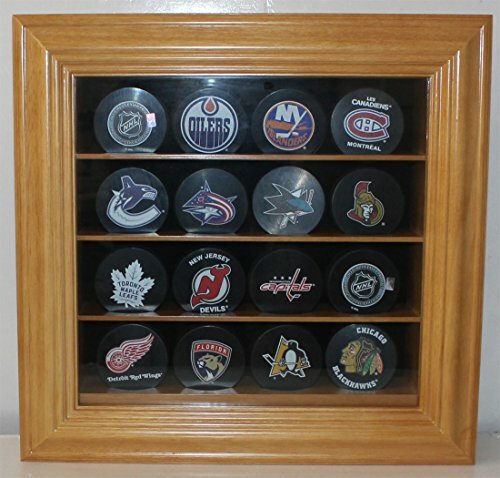 Solid furniture grade beech hardwood hockey puck display case of beautiful design and construction is the perfect solution to show off 40 of your prized hockey pucks. Cabinet comes in oak, cherry, walnut, or black finish and features an acrylic door (98% UV resistant with two keys) with brass lockable latches to keep out dust. Black felt background gives added contrast. 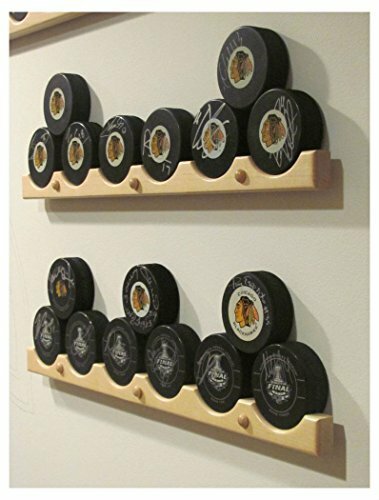 Matching wood shelves come with indentations to securely hold the pucks in place. Display case will come delivered fully assembled and with installed heavy duty wall hanging hardware (pucks are not included). Outside Dimensions: 30"H X 16.5"W X 4.00"D Inside Depth: 3 1/4"
Crafted from solid beechwood, not veneer or particular boards. Hockey Pucks/Yo Yos NOT INCLUDED. Beveled shelves to prevent Hockey Pucks from sliding flat. 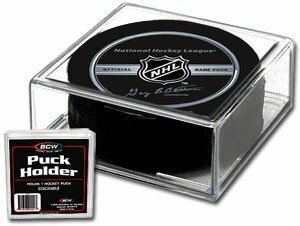 Holds Regulation sice 20 Hocky Pucks OR 25 reguarl size Yo Yos. Felt Interior background. Metal brackets on back for hanging Dimensions: 21.5"H X 14"W X 2.2"D Interior Depth: 1.25". Space between rows: 4"H for the top and Bottom row. 3.6"H for the middle 3 rows. Warning: The shelves are lipped the edge. However, they are flat inside. The pucks can roll left and right unless you fill the whole row up with pucks or other objects. 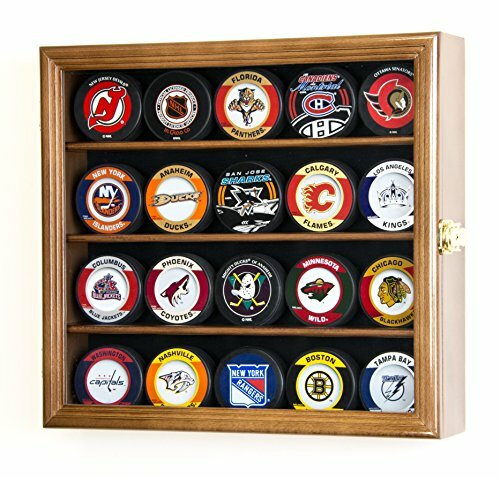 Our puck racks are a great affordable way to display your collection of hockey pucks on any home or office wall. 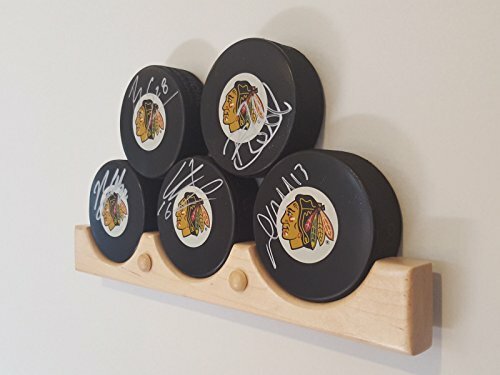 Our puck racks are designed to hold loose pucks or pucks that are in plastic tube puck holders. We take pride in every puck rack that we make. Our puck racks are made from Maple and finished with three coats of polyurethane. *THIS PRODUCT CONTAINS MOUNTING INSTRUCTIONS AND ALL MOUNTING HARDWARE NEEDED. * 6 PUCK RACK = 22" IN LENGTH. HAPPY STICK DISPLAYS have been MANUFACTURING our puck racks for over 10 years. Featured in USA Hockey magazine. 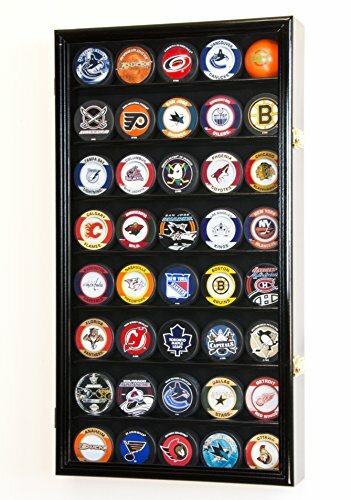 The display case is made for hockey puck display. 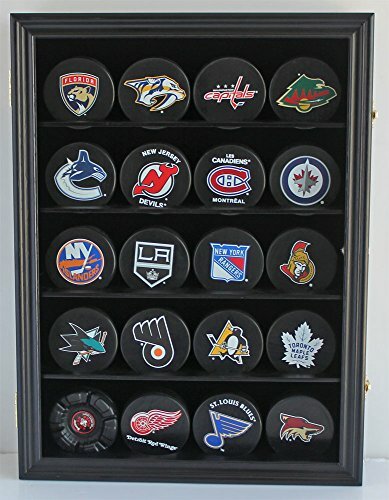 Holds 16 hockey pucks. Each shelf has a cut-out hole for the hockey pucks to sit. Made of solid wood, the display case comes with a hinged glass door to keep dust away protecting the balls. The surface is sanded to perfection. There are already wall brackets on the back of the display case for hanging. No assembly required. All you need are 3 nails. 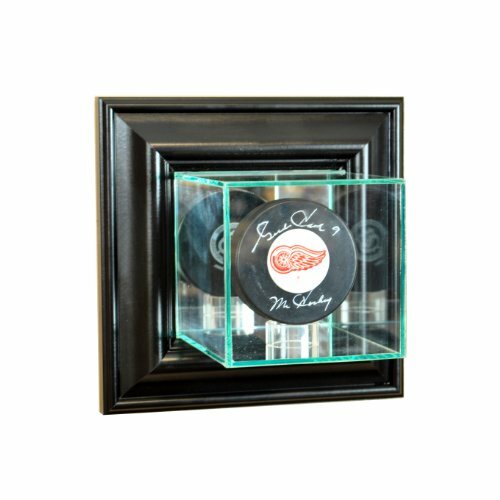 This uniquely designed wall mounted display case is the perfect way to protect and display your autographed hockey puck. This case is made so that the top hinges open for easy access inside. This display case is made with UV Protected, double strength glass and mirror and accented with real wood molding. This display case is made with mirror on the back to enhance the look of what you want displayed. We also use no acids in our display cases to prevent signature fading. 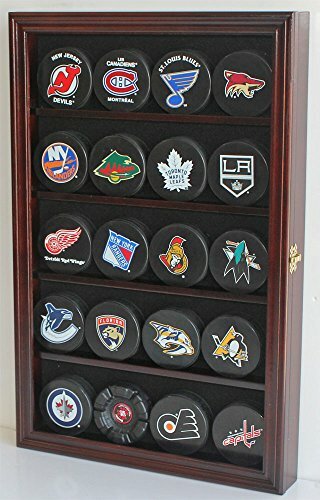 This display case comes with an acrylic holder for your puck.